Tales of Mommyhood: Funky Socks For Kids - Are You Kidding? Funky Socks For Kids - Are You Kidding? Anyone that knows me well, knows how much I hate wearing socks. BUT - given that I am prone to having chilly feet, they are a must. I figure if I am going to have to wear them, I might as well have fun with them. The boys seem to feel the same way, and while home they are almost always in bare feet. For school, and trips outside (bare feet in shoes/boots really is not comfortable) they will give in and wear socks - but like me, they want them to be fun! I like to buy funky socks. My kids seem to like my style, and when I saw the socks that Are You Kidding? offers, I was fairly certain that they would love them too. When the socks came in, I was happy to see that the colours shown on the website are very true to the actual colour (sometimes lighting in pictures can change shades). The boys were excited and couldn't wait to try on their new socks. I received a set of 3 pairs for each of the boys (although they are all mixed up and neither set belongs to either of them). 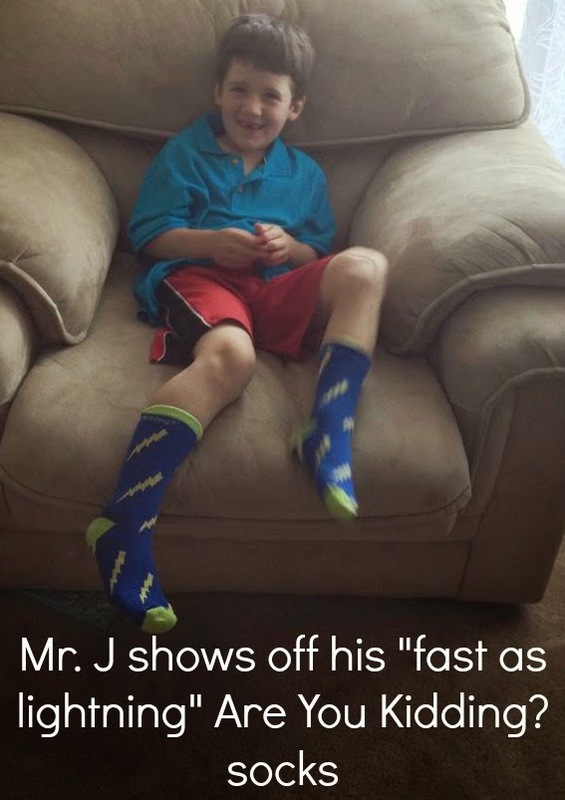 Mr. J seems to like the lightning socks, and Mr. J really likes the monster eyes. The socks are soft and comfortable, and have held up to the dirt, wear and constant laundering that has been needed. Are You Kidding? socks are the designs of 6 year old Sebastian, who has his own love of crazy socks! They are available in size S, M , L and XL (S and M come with non-stick dots on the bottoms). Both of my boys are wearing a L (size 12 child and size 1 youth) although they are slightly big on Mr. K.
BUY IT: You can purchase Are You Kidding? socks on their website for $15.00/set (3 pairs). Are You Kidding is offering Tales of Mommyhood readers a discount code for 15% off your entire cart. Use code mommyhood at checkout to receive your discount. WIN IT: Fill out the Giveaway Tools form below for your chance to win a set! Tales of Mommyhood received the above product in exchange for this review. All opinions belong to Tales of Mommyhood and your opinion/experience may vary. Tales of Mommyhood disclosure policy. I would love to win the Boy’s Surf ‘n Turf for my son! Thanks! I think the girls buzz off are cute,thanks for the chance! I like the GIrl's Comic collection. I would get my son the boy's comic socks. I like the Girl's Buzz Off set. I love the Girls Buzz Off set! I would most like to win the Girls Eye See You! I would get "Girls Eye See You "
I like the Girl's Buzz Off socks - very cute! I would choose boys comic for my son. I would love the boys surf and turf. Boy's surf and turf! fun! I love the girl's comic the best. Loving the Girls Eye See You! If I won I would pick the Girl’s Comic, so cute! I like the surf n turf sock set! I love the Girl’s Comic sock set! Id pick the girls buzz off set. I love the Girl’s Buzz Off. Girl’s Buzz Off is cute. I would choose the girls "buzz off" set. girls buzz off for sure!! my girls would love these socks! Like the boys comic set! THE BOYS COMIC ONES ARE TOO CUTE! I like the Girl’s Eye See You. I like the girls buzz off socks. I would pick the boys "surf and turf". Fun!